It doesn’t matter how much you look smart and attractive in a sweater or jacket. 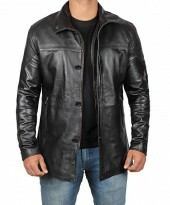 Leather coat always becomes a superb choice due to its style and efficiency both. It’s warm enough, easily fits with any dress and makes your personality different from others. Is leather coat in style? Yes, Leather coats are in style, especially in the colder months. Which internal lining is used in mens leather fur coats? Shearling lining is more common in coats but viscose lining is also used.. Which color is most common in long leather coats? Black and dark brown colors are mostly used for coats. Other colors are also popular in fashion trendy people like a red leather trench coat. Can guys wear long trench coats? Yes, it’s all time favorite outerwear for guys. How much is a good leather shearling coat? It starts from 140$ to 200$. Which leather is best for men's leather coats? Big lapels collar vs shirt collar style in black leather trench coat? Big lapels give an extraordinary look to the coat that's why it is more common than other styles. Is a long leather coat with a fur collar warm enough for winter? 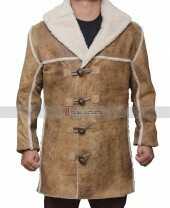 Fur collar coats give a stylish look and provide comfort. It is enough for the winter season and cold regions. Can I wear Brown leather coat at the Halloween party? Trench coats are the best apparel for cosplay parties and events.